If you have a headache, you're not alone. 9 out of 10 Americans suffer from headaches. Some are occasional, some frequent, some are dull and throbbing, and some cause debilitating pain and nausea. · If you spend a large amount of time in one fixed position, such as in front of a computer, on a sewing machine, typing or reading, take a break and stretch every 30 minutes to one hour. The stretches should take your head and neck through a comfortable range of motion. · Low-impact exercise may help relieve the pain associated with primary headaches. However, if you are prone to dull, throbbing headaches, avoid heavy exercise. Engage in such activities as walking and low-impact aerobics. · Avoid teeth clenching. The upper teeth should never touch the lowers, except when swallowing. This results in stress at the temporomandibular joints (TMJ) - the two joints that connect your jaw to your skull - leading to TMJ irritation and a form of tension headaches. · Perform spinal manipulation or chiropractic adjustments to improve spinal function and alleviate the stress on your system. · Provide nutritional advice, recommending a change in diet and perhaps the addition of B complex vitamins. · Offer advice on posture, ergonomics (work postures), exercises and relaxation techniques. This advice should help to relieve the recurring joint irritation and tension in the muscles of the neck and upper back. The ACA (American Chiropractic Association) notes the following quote: "Doctors of chiropractic undergo extensive training to help their patients in many ways - not just back pain," says Dr. McClelland. "They know how tension in the spine relates to problems in other parts of the body, and they can take steps to relieve those problems." Its really awesome information you have posted here. 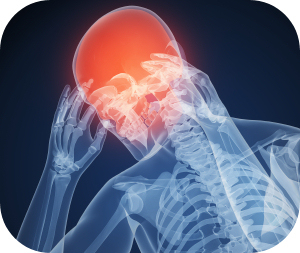 Cluster headaches result in periodic episodes of intense head-splitting pain. This condition is a neurologic condition that is one of the most painful types of headaches. Chiropractic treatment can be very helpful in minimizing the resultant pain and allow patients to work, play socialize, and sleep better.